At 1600 hours on Wednesday June17th Hinckley’s Bermuda 50 sailed away from the company’s Southwest Harbor, Maine boatyard bound for her homeport in Rhode Island. The excitement and the champagne that would surround the launch of the first new Hinckley sailboat in over ten years would have to wait as the Bermuda 50 was all about the business of making it to the start of Block Island Race Week. The boat, Watermark out of Jamestown, RI, will have fulfilled her dual purpose as cruiser and competitor before the first week under her new burgee is over. Her plumb bow, flush deck and long bowsprit are a new look for the 87 year old Hinckley, but then, the Bermuda 40, built out of fiberglass in 1960, was modern in her day. The Bermuda 50 is designed by Bill Tripp III, whose father, Bill Tripp Jr., designed the Bermuda 40. Hinckley and Tripp announced the Bermuda 50 collaboration at the end of 2013. Two have been built so far. The Hinckley Bermuda 50 is designed as an advanced performance sloop that captures the best of design and technology. For sailors who wish to have a yacht they will be proud to cruise and race over many years, with the head turning beauty and elegance that is unmistakably Hinckley, the Bermuda 50 is the modern day evolution of the Bermuda 40. On deck and below, this vessel embodies all the finish qualities that have characterized a Hinckley yacht in the past, but with crisp modern lines. This new Hinckley will define dual purpose sailing for generations to come in much the same way as its predecessor, the Bermuda 40, did. Or perhaps, does. 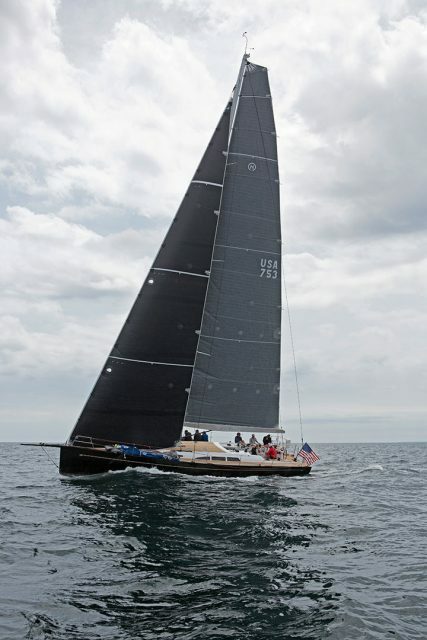 A modified Bermuda 40 won the Newport Bermuda Race in 2014. Utilizing carbon fiber throughout hull, deck and spar, high-tech construction techniques, and the latest in sail handling systems, the versatile sloop can be comfortably handled by a couple, but will also easily accommodate a family, or another two couples for safe, luxurious, performance cruising. With a hydraulic lifting keel the Bermuda 50 will access shallow anchorages from the Chesapeake to the Bahamas, and will sail swiftly from harbor to harbor even on challenging offshore passages. The simple geometry of this modern rig is easy to handle and is well suited for competitive racing under IRC and ORR rules. The Bermuda 50 will excel in a broad range of events from regatta race weeks to the Bermuda Race. The Hinckley Company’s roots are deep in soil of Maine boatbuilding. The company, founded in 1928 to build and care for the boats of the local lobstermen, has been in continuous operation building such classics as the Bermuda 40 and the Picnic Boat. Henry Hinckley set the course with the Bermuda 40 in the early 1960s when he crafted her stunning lines out of a new material, fiberglass. The combination of elegant form, material innovation and brilliant attention to finishing detail set the course Hinckley has been on ever since in the pleasure boat business. Today, Hinckley builds powerboats and sailboats from 29 to 70 feet and supports its owners and other yachtsmen with its network of service yards from Maine to Florida. In 2014jj the company launched two new models to much acclaim: The Talaria 48 and the Hinckley T34. The Picnic Boat is in its third iteration with recent updates including heightened speed and more refined accommodations. The Hinckley Company will launch the Talaria 43 and the Bermuda 50 in 2014. For information please visit www.hinckleyyachts.com/Sailboats/B50/b50.php. Tripp Design Naval Architecture is a team of Naval Architects and Engineers specializing in the design and engineering of advanced and thoroughly modern performance yachts. Our firm was founded in 1983 by William H. Tripp III, son of the legendary naval architect William H. Tripp, Jr., who designed the Hinckley Bermuda 40 in 1958. Based in Connecticut and with an office in Amsterdam, Tripp Design has a large following in both the US and Europe. Advanced performance, original modern architecture and careful detailing are the common thread throughout Tripp Design’s creations, whether racing boats or larger yachts. Features like lifting keels, composite construction, and composite rigging combined with strict weight control procedures are typical of the means we use to create truly advanced performance racer/cruisers. Tripp Design currently has yachts in development ranging in size from 42’ race boats to large performance cruising yachts capable of operating safely and autonomously in the world’s most remote regions. « How are you spending this Father’s Day?